Chicken! One of the all time comfort foods. I love fried chicken more than I should. The bad thing about chicken is that it’s so hard to find a good local place. In most places I have lived, Popeye’s was the best choice (and is still by far my favorite chain). On my way home not long after moving to Lansing, I pulled off the highway for gas. 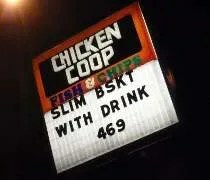 Across the street was a restaurant called the Chicken Coop. I stopped and picked up some popcorn chicken for the drive home. Not long after that, the Chicken Coop was torn down and replaced by a Walgreens. The restaurant relocated around the corner. Again, on a trip home, I stopped for gas and picked up some popcorn chicken to eat in the car. 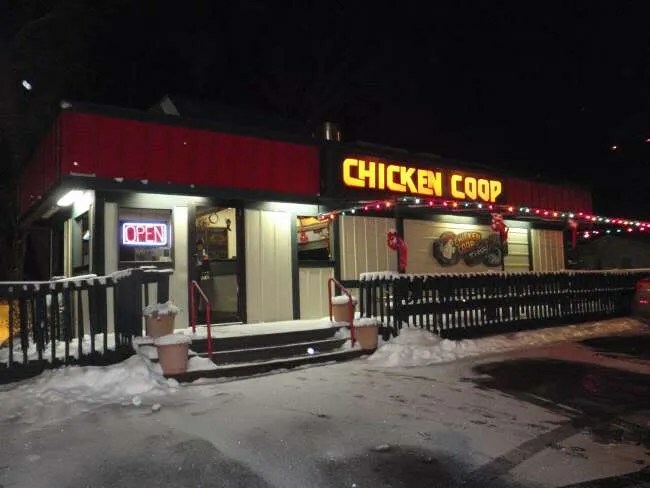 I didn’t realize at the time that the Chicken Coop was a local chain with stores in Kalamazoo and Portage. I drive by a couple of the stores all the time and when I got the chicken craving, that’s where I headed. The Chicken Coop on South Westnedge is on the corner at Howard Street in Kalamazoo’s Southside neighborhood. If you’re heading north, you’ll have to turn on to Howard from Park Street. If you’re heading south, it’ll be on your left. It’s a small building that only does take out. The are no tables inside. There’s only an order counter and a Pepsi machine. There aren’t even any chairs while you’re waiting. It was a pretty busy night. There were three people in the shop when I got there and two in the drive-thru. 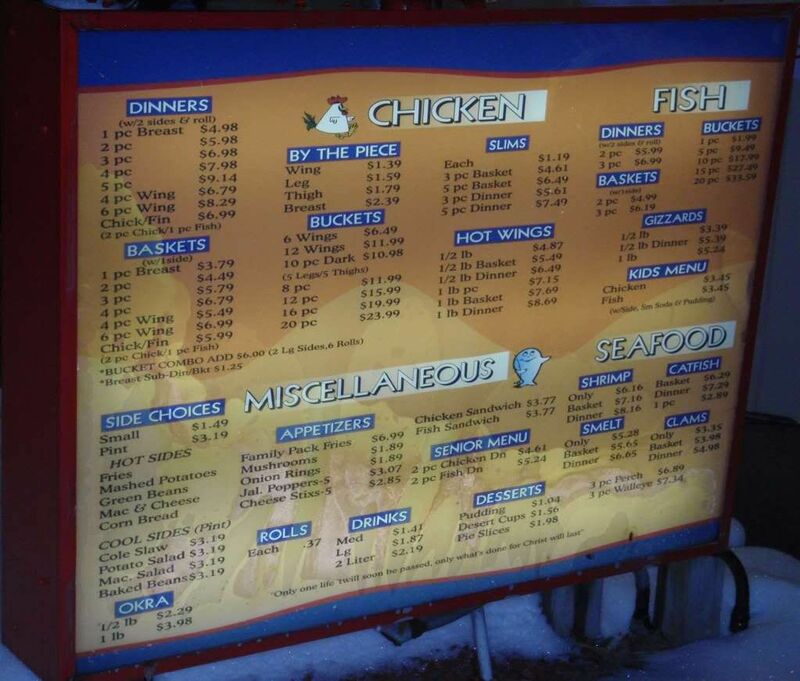 The wait gave me a chance to look over the menu. I just wanted a bucket of chicken and J wanted a side or two, so I just had to figure out what option was most cost-effective for us. As the lady working behind the counter finished with the guy in front of me, she started asking for my order. She was walking away from me as she was talking, so I wasn’t sure if I should say anything, but she looked over her shoulder with a “come on, now” glance. 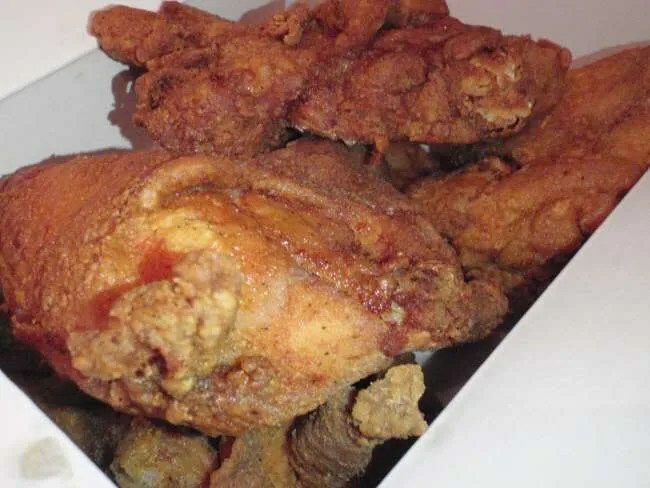 I ordered an eight piece bucket of chicken and made it a combo which cost an extra six bucks. Making it a combo gave me two side choices and six rolls. For the sides, I got macaroni and cheese for J and an order of fries for myself. The chicken is already cooked, but they don’t keep it in warmers. They actually throw it back into the fryer to reheat, so there’s a little bit of a wait while the chicken is warming up. It took about ten minutes for my order to be put together. I handed over my credit card to pay the $19 tab. The thing that really bothered me about the place was the clerk had to take my credit card to a machine back in the kitchen out of my view. I’m really, really not a big fan of this. I’d rather be able to see my card the whole time it’s in someone else’s hand. I know you can make the argument that it’s the same as my card being taken at a restaurant, but in most restaurants, the computers are in the dining room in public places. You don’t see many waitresses going into the kitchen to run a card. I tried to peak around the corner just to see if I could see her. It’s not that I didn’t trust this particular clerk. I don’t trust anybody with my credit card. It’s too easy to steal these days. I don’t know if all the Chicken Coop’s are like this, but I probably won’t go back unless I have cash to pay. That makes me really uncomfortable. Anyway, on to the food. I walked in the door with two bags off food. Way too much for just J and me. What we ended up doing was eating the food that is better warm and put the food that could be eaten cold in the fridge for lunch tomorrow after we had a chance to try everything. The chicken is delicious. The white meat was very juicy, which I liked. J was a huge fan of the breading and I have to agree. It was a much lighter breading than the big chains use. Not big crunchy pieces. It kind of hugs the meat. The portion of fries was pretty big. Since fries taste awful cold, I ate the whole boat alongside a breast and a drumstick. 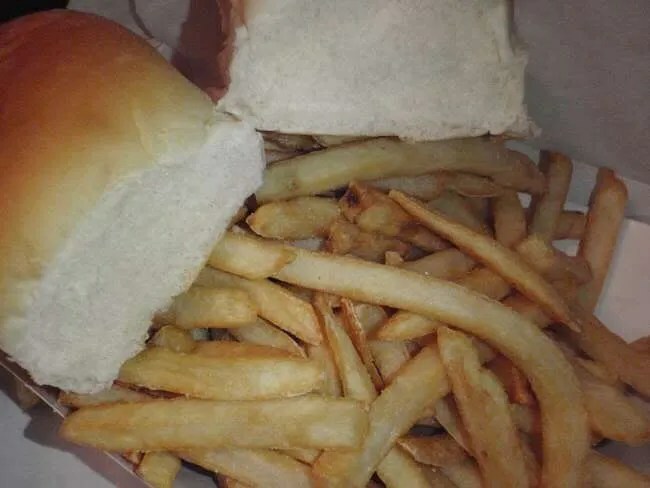 They were typical restaurant fries, but I was hungry and they hit the spot. 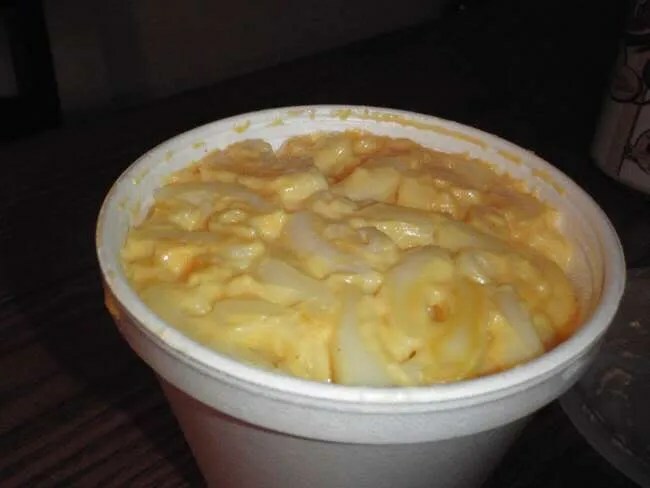 The macaroni and cheese also came in a pretty big cup. J had a few bites just to taste it then put it in the fridge for tomorrow. She said it was good and she may have to fight me for it for lunch. We’re sold on the food at the Chicken Coop. J’s always been pretty picky about chicken. She prefers Brown’s Chicken (a Chicago chain) because that’s what she grew up. She compares every piece of chicken she has to them. My measuring stick is Popeye’s. Both of those chains are cheaper than the Chicken Coop, but I got to say the Chicken Coop was better chicken. I appreciate any place that can give me juicy white meat. I have a problem with the credit card thing, but other than that, I’m really glad I braved the very slippery Westnedge Hill to pick up chicken. I agree that chicken coop is a small chain, I know of locations in Benton Harbor, Elkhart, Paw Paw, kalamazoo, Portage, & South Haven. But I have never been able to find a website and/or franchise information. That one closed along time ago! It’s empty now, but was a Domino’s 2 or 3 years ago. really? I stopped for gas in Dowagiac this summer and thought I saw the sign…I didn’t stop or go close, but I just assumed it was open. The next time, I am in Dowagiac, I’ll have to look for the sign you saw, it maybe it’s an old sign or they reopened it! you know what? It wasn’t Dowagiac…..it was Watervliet. That makes sense, Watervliet is right on I-94. Watervliet is by far the best out of all the Chicken Coops.